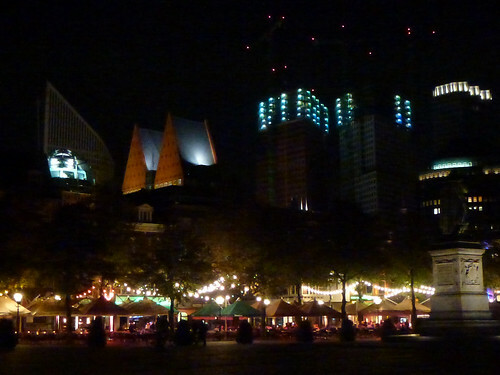 Friday night and Saturday afternoon/night we went to Den Haag. DB won free tickets (thanks KINK!) to TodaysArt. As they state on their web site, “TodaysArt is a festival concept that revolves around the presentation and development of adventurous contemporary visual and performing arts”. Friday night we saw two dance programs, the first MCDance and the second Hiroaki Umeda from Japan with Holistic Strata. I enjoyed them both so much! The performances were very different, but the same in that they relied heavily on video and music. Actually, video, music and dance combined to create really unique experiences for the audience. I felt so much a part of the room and everything in it because more of your senses were engaged. The dancers in MCDance were absolutely amazing. They (1 man, 1 woman) also choreographed the dance. Hiroaki Umeda did not put as much into the dance as he did into the video and music, but still amazing to watch and participate in. Saturday we went back in the afternoon, hoping to see some open air things, but that part was pretty disappointing – not much to see. So we went shopping. Well, I did anyway – bought a dress – which needs altering of course (as does everything I buy in this country of giants). In the end we went back to the same theater to see Murcof. DB had heard of him but I had not. He made a collaboration with a Dutch video artist named Simon Geilfus and the two of them created an hour of enthralling sight and sound. The sound was sometimes very ambiant, sometimes reminded me of bits of Pink Floyd, sometimes like nothing I’d heard before. They both sat at tables with computers and electronic equipment. In front of them was a translucent screen where the images were projected, but through which we could still see them sitting. The images were all very geometric, computer generated, sometimes so 3-D you could touch them. Sometimes almost seeming alive. We only saw a bit of the festival, but what we saw I loved and highly recommend. We had to get to the venue early to get seats as there were only 200 and both nights were sold out. 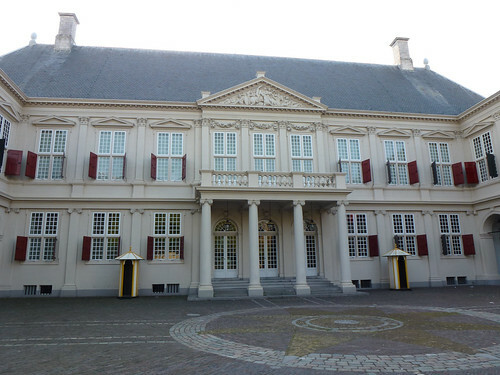 through the Binnenhof, and out the other end to the Plein. There are outdoor cafes, buzzing with people, and the Ministry buildings and other high rises behind them. In person it’s a very interesting image. My little camera didn’t capture it so well, but maybe you get the idea. If you’re in town, on a clear night, go check it out.